Madhya Pradesh often termed with the acronym MP. Madhya Pradesh is the Heart of India, and in central India, with Bhopal as capital and Indore is the largest city. The second largest state by area and sixth largest state by population with 75 million. It has been center for cultural heritage of Hinduism Buddhism, Jainism and Islam. 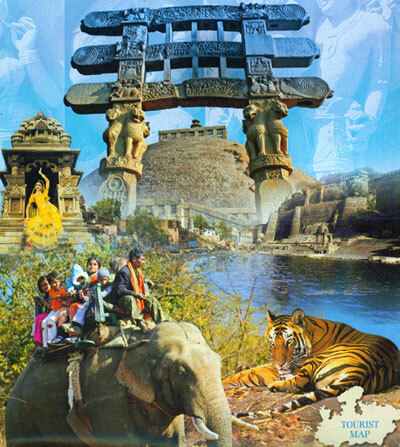 Madhya Pradesh has numerous monuments, delicately carved temples, stupas, forts and places all over the state. The State has everything spectacular mountain ranges meandering rivers and massive forests. The best part of MP is its accessibility. Whether you are in Delhi, Kolkata, Mumbai, Chennai you are never far from Madhya Pradesh. Pachmarhi, Marble Rocks (Bhedaghat), Bandhavgarh National Park, Kanha National Park, Panna National Park, Pench National Park, Shivpur. Most of the Shunga period sculptures from Vidisha region. Indian art in general. & Pratihara art in particular. The world-renowned Gyaraspur Shalabhanjika (10th century AD) is housed here. BHOPAL: The vibrant state capital has a long history of which it is justly proud. Bhopal stands on the site of the 11th century city of Bhojapal, founded by Raja Bhoja. The founder of the existing city was, however, an Afghan soldier of fortune, Dost Mohammed (1708-1740), who carved out his capital here during the chaos that followed Aurangzeb's death. Here, Dost Mohammed encountered the beautiful Gond queen. Kamlapati, who sought his aid after the murder of her consort. A charming legend relates how the queen would recline in a lotus barge and drift across the lake on moonlit nights. The two lakes of Bhopal still dominate the city and are indeed its nucleus. The old city's teeming markets, mosques and palaces, still bear the aristocratic imprint of its former rulers. Visit the Taj-ul-Masajid one of the largest mosques in India—the Jama Masjid, Moti Masjid as well as the Shaukat Mahal, Sadar Manzil and Gohar Mahal in the Chowk area of the walled city. The new city is equally impressive, with lovely parks and gardens, broad avenues and modern edifices. Don't miss the famous multi-arts complex Bharat Bhawan, the Museum of Man, and Van Vihar National Park. Enjoy an evening at the Boat Club on the Upper Lake. 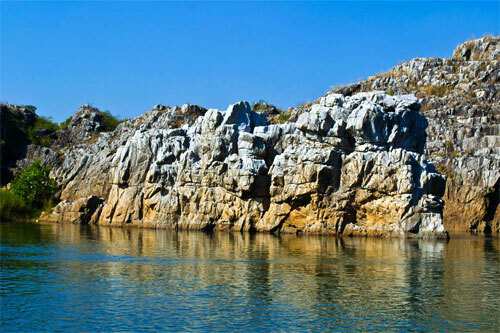 JABALPUR: Pleasure resort and 12th-century capital of the Gond kings, Jabalpur was later the seat of the Kalachuri dynasty. The Marathas held sway until 1817, when the British took over and established the spacious cantonment with its elegant colonial residences. 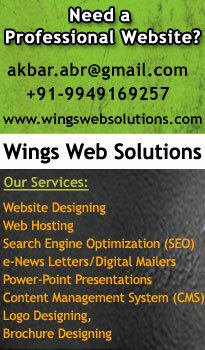 Today Jabalpur is an important administrative and commercial centre. UJAIN Considered one of Hinduism's seven sacred cities, Ujjain is also one of the four centres of the 12-yearly Kumbh Mela (Simhastha). The holy town sees a steady stream of pilgrims through the year, but at the time of the Kumbh the stream swells to a flood. Legend has it that this ancient town got its name when the god-like King Shiva of Avanti com­memorated his victory over the demon ruler of Tripura by renaming his capital, Avantipura. as Ujjayini ('one who conquers with pride'). Several dynasties ruled over this prosperous town and it is said to have been the seat of the vice-royalty of Ashoka in 275 BC. In its heyday, Ujjain was on a nourishing trade route with Mesopotamia and Egypt. The great poet Kalidasa is said to have written some of his works, including the epic Meghdoot, here, at the court of Chandragupta II. Ujjain's final decline as a political­ly important centre dates to when the Scindia capital was moved to Gwalior in 1810. Little survives of this impressive past in modern Ujjain. But, lying on the banks of the sacred river Shipra. the site of the spectacular bathing ritual at the Simhastha, it still abounds in temples with hoary tra­ditions. Though many temples were built upon ancient sites, the structures that stand today are of a more recent date, all of which have been renovated or rebuilt over the years. The main temples include the Mahakaleshwar Temple, Bade Ganeshji ka Mandir, Harsiddhi Temple and the Chintamani Ganesh Temple. The Mahakaleshwar Temple, dedicated to Shiva, and housing one of the 12 Jyotirlingas, was rebuilt by the Marathas in the 18th century. Other sights worth seeing in Ujjain are the Pir Mastyendra-nath, Bhartrihari Caves, Durgadas ki Chhatri, Kal Bhairava, Gad Kalika, Vikram Kirti Mandir, Gopal Mandir, Navgraha Mandir (Triveni), Panchkroshi Yatra, Siddhavat, and the Vedha Shala (Observatory). A few kilometres outside of Ujjain town is the Kaliadeh Palace, an imposing 15th century structure built by the Malwa rulers. Getting here: 5 5km from Indore. 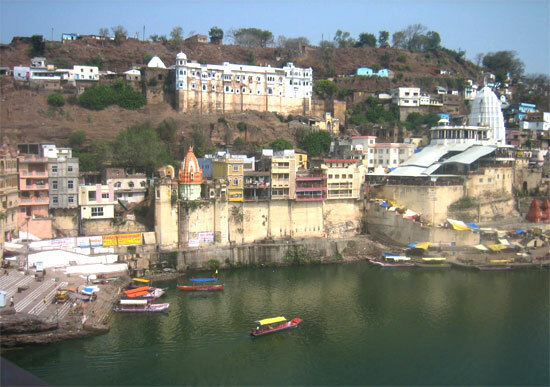 OMKARESHWAR: A riverine island at the confluence of the Narmada and the Cauvery, Omkareshwar is renowned for its medieval Brahmanic temples. This tiny island consists of two hills and a valley, thought to resemble the Hindu symbol 'Om'. The exquisitely carved Shri Omkar Mandhata ('Bestower of Desires') Temple on the island houses one of the twelve Jyotirlingas. The Siddhanath Temple is a fine example of 10th century architecture. The 24 Avatars, a cluster of Jain Temples and the Satmatrika Temples are also worth visiting. The Kajal Rani Cave, 9km from Omkareshwar, is a scenic spot with spectac­ular views of the undulating landscape of the region. Getting here: 78km from Indore. 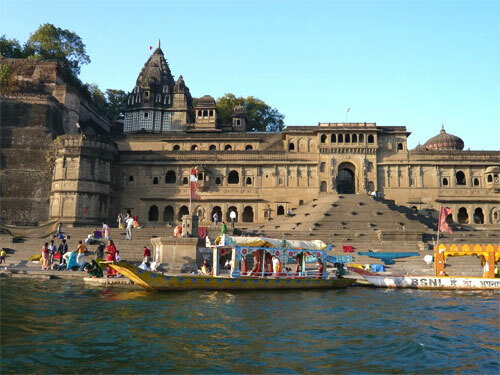 MAHESHWAR: Located on the banks of the Narmada river, Maheshwar was identified as 'Mahishmati', an important cultural and political cen­tre that finds mention in the Ramayana and Mahabharata. The town was restored to its pre-eminent position in the 18th century by the revered Holkar queen, Rani Ahilyabai of Indore. She is credited with having commissioned many temples and a fort com­plex, which still stands today. 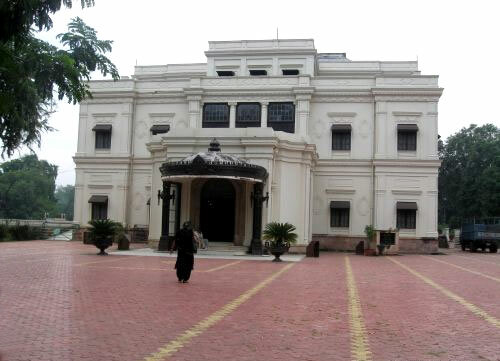 The palace inside the fort is now a museum that exhibits the treasures from the royal family. Also inside the fort is the Rehwa Weavers' Society, which produces the exquisite Maheshwari saris for which this town is justly famous. The town's 1.5km-long river front is renowned for its bathing ghats and rows of pretty, tiered temples, which are distinguished by their over­hanging balconies and intricately ornamented door­ways. The important temples in Maheshwar town include the Kaleshwara, Rajarajeshwara, Vithalesh-wara and Ahileshwar. A fan-shaped stairway leads from the river to the Maheshwar Fort's royal enclosure and the Ahileshwar Temple, built in 1798. 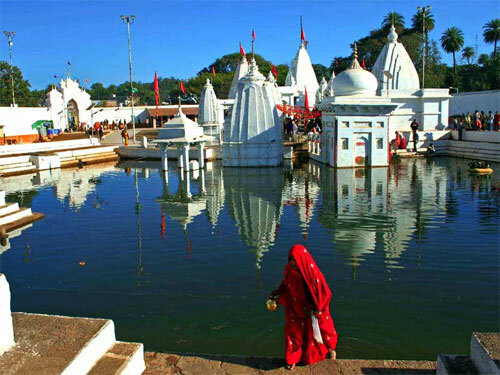 AMARKANTAK: The Satpura and the Vindhya ranges meet at Amarkantak, which is also the source of the Narmada and the Sone rivers, and a great pilgrim­age centre. The Narmada Udgam and the Sonmuda Temple, the source of the Narmada and the Sone respectively, are the holiest shrines. According to the Puranas, it is necessary to bathe once in the Ganga, thrice in the Saraswati and seven times in the Yamuna to attain salvation, but just the sight of the Narmada is enough to ensure eternal bliss. The Narmada Udgam Temple contains a black basalt stone statue of the godess Narmada, which is worshipped by thou­sands of devotees every year. The Dhuni Pani hot springs, Brighukamandal, Dugdhdhra and Kapildhara waterfalls, densely forested slopes and the lovely garden temple at Mai ki Bagiya, give Amarkantak a serene charm that is not to be missed. Getting here: 228km from Jabalpur; 45km from Pendra Road. CHITRAKOOT: The hill of many wonders', Chitrakoot nestles amidst tranquil forest glades and mountain streams in the Vindhyas. Chitrakoot's spiritual legacy dates back to the time of the Ramayana—Rama and Sita are said to have spent eleven of their fourteen years of exile here; this is where the great Sage Atri and Sati Anusuya meditated, and the holy trinity of the Hindu pantheon—Brahma, Vishnu and Mahesh—were incarnated here. See Ramghat, Kamadgiri, Janaki Kund, Sati Anusuya, Sphatik Shila, Hanuman Dhara and Bharat Koop. The Gupt Godavari Caves are also worth exploring. Getting here: 195km from Khajuraho; 78km from Satna. PACHMARHI: Now a Biosphere Reserve, Pachmarhi is a lovely hill resort girdled by the Satpuras. Bridle paths lead into placid glades, groves of bamboo, jamun and dense sal forests. Cascading waterfalls flash in silver streaks down the slopes. Deep azure pools beck­on swimmers. Complementing the magnificence of nature are the works of man. The cave shelters of the Mahadeo hills present astonishing rock paintings. Most of these are thought to date back to 500-800 AD, but the earliest paintings are estimated to be 10,0(30 years old. Make sure you have time to see the Jamuna Prapat (Bee Falls) and Rajat Prapat (Big Falls), two of the most majestic waterfalls in the area. Other notable sights in Pachmarhi are Priyadarshini Point, Handi Khoh, Apsara Vihar, Irene Pool, Jalawataran, Sunder Kund, Mahadeo, Chhota Mahadeo, Chauragarh, Jata Shankar, Dhoopgarh, Pandav Caves, Piccadily Circus, Vanshree Vihar, Reechhgarh, Sangam, Catholic Church, Christ Church, Satpura National Park, Bison Lodge and the Cave Shelters. Getting here: 195km from Bhopal. Soaring in glittering splendour, the Marble Rocks at Bhedaghat rise to a hundred feet on either side of the Narmada as it flows through a narrow gorge. Don't miss a moonlight river ride (boating is available from November to May). Also check out the stunning Dhuandhar Falls and the Chausath Yogini Temple. And pick up an exquisite soapstone souvenir while you're at it. Getting here: 2 3 km from Jabalpur. Tiger-spotting is virtually guaranteed at Bandhavgarh as it has the highest tiger density in India. This is where the Maharaja of Rewa found the world's first white tiger. enotaphs. Check out Madhav National Park, the Scindia Chhatris, Madhav Vilas Palace, George Castle, Bhadaiya Kund, and Sakhya Sagar Boat Club. The park is replete with deer, leopard, sambar and wild boar. More than twenty-two species of mammals and two hundred and fifty species of birds can be found here. Dominating the park is the Bandhavgarh Fort and Prehistoric Caves rich with inscriptions and drawings. Getting here: 164km from Jabalpur; 2 37km from Khajuraho. Tiger since 1974. Kanha does Madhya Pradesh proud. Vividly portrayed in Kipling's Jungle Book, its sal forests, grasslands and streams are the haunt of the majestic tiger. Fauna includes leopard, gaur, barking deer, black buck, the rare hardground barasingha and over two hundred avian species. Don*t miss the sunsets at Bamni Dadar. Getting here: 165km from Jabalpur. Dominated by he splendid Ken river, alternating valleys and plateaus, grasslands, gorges and escarpments, Panna National Park is ideal tiger country. Enjoy the thrill of a jeep safari at night or boat down the Ken to see crocodiles sunning themselves. The spectacular Raneh Falls are nearby. Getting here: 32km from Khajuraho. Now renamed Indira Priyadarshini Pench National Park, it is known for its large population of chital and sambar, and the Pench Tiger Reserve boasts of the highest density of herbivores in India. The area is specially famous for large herds of gaur, Nilgai and wild dog. The tiger, leopard, barking deer and chinkara are also found in large numbers, along with over two hundred and eighty-five species of resident and migratory birds. 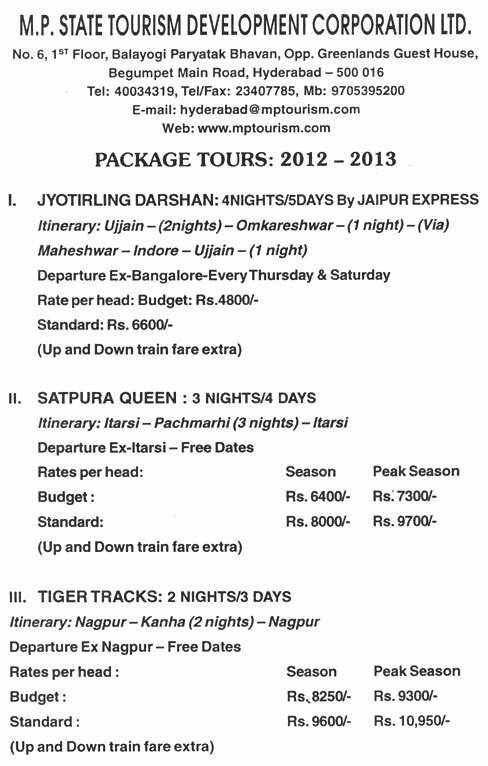 Getting here: 110km from Nagpur: 195km from Jabalpur. Steeped in its royal past; Shivpuri's dense forests were once the hunting grounds of the Mughal emperors, where elephants were captured for the royal stables, and tiger was stalked. Its luxuriantly forested hills made it the natural summer resort capital of the Scindia rulers of Gwalior. Its royal legacy endures in the form of exquisite palaces, hunting lodges, and cenotaphs. 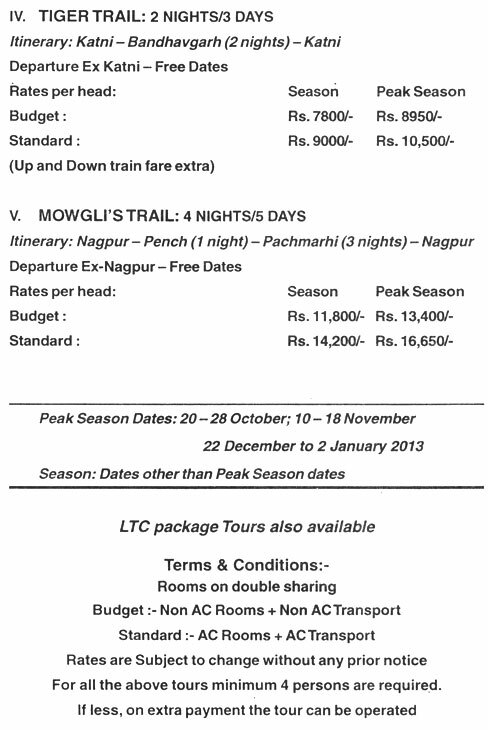 Check out Madhav National Park, the Scindia Chhatris, Madhav Vilas Palace. George Castle. Bhadaiya Kund, and Sakhya Sagar Boat Club. .
Getting here: 112km from Gwalior. Bird life is abundant in all the National Parks & wildlife Sanctuaries. The State Directorate of Archaeology & Museums also maintains site museums at Ashapuri, Bhanpura. Damoh. Kundeshwar and Chanderi. Other museums worth seeing are Rajgarh, Shahdol, Panna and Mandla. The ASI maintains collections of sculptures at Chanderi, Badoh-Pathari, Gyaraspur, Thruvanji, Mandhata, Nachna and Bijamandal (Vidisha). Among India's best-loved and most impressive monuments, the Khajuraho temples, a World Heritage Site, attract tens of thousands of visitors from all the world every year. Eighty-five extraordinary temples were built over a relatively brief period of 100 years, from 950-1050 AD by the Chandela Rajput rulers. Only twenty-two temples have survived the rav­ages of time. Architecturally. Khajuraho's temples are unique, notably different from the prototype of their period. Each stands on a high masonry platform with a marked upward direction in the structure, further enhanced by vertical projections to create the effect of grace and lightness. Each of the chief compartments is mounted by its own roof, grouped so that the highest is in the centre, and the lowest over the portico. A highly imaginative recreation of the rising peaks of the Himalayas, abode of the gods. The three main compartments to each of the temples are the entrance (ardhamandapa), assembly hall (mandapa), and the sanctum (garbha grihas). The more developed temples have further additions and embellishments. The temples, built mostly of sandstone, are conve­niently divided into the Western. Eastern and Southern groups. 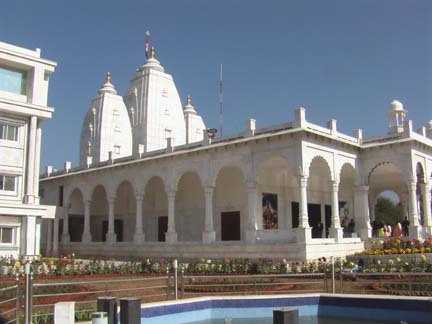 The Kandariya Mahadeo Temple in the Western group, dedicated to Shiva, is the largest and tallest of them all. Some of the other superb examples of temple architecture and sculpture include the Lakshmana and Vishwanatha Temples. The Western group is also the venue of a fascinating Son-et-Lumiere show (in both Hindi and English), which tells the story of the great Chandela kings and recreates the legend of the Khajuraho temples. The main structures in the Eastern group include the ruined Gantal, the Javari. the Vamana and Brahma Temples. Of the three Jain Temples that stand near the Ghantai Temple, the Parsvanatha is considered the finest. The backdrop of the Vindhya hills makes a dramatic backdrop to the Duladeo and Chaturbhuja Temples, both in the Southern group. The Archaeological Museum and the State Museum of Tribal and Folk Art are also worth a visit. Getting here: 64km from Mahoba; 94km from Harpalpur; 1 75km from Jhansi; 117km from Satna. Founded in the 8th century by the chief­tain Suraj Sen. Gwalior was named by him after the her­mit saint Gwalipa who had cured him of a deadly disease. A succession of Pratiharas. Kachwahas and Tomars have left a legacy of wonderful palaces, temples and monu­ments. The town is defined by the spectacular Gwalior Fort, a brilliant specimen of medieval architecture. Some notable structures within the fort include Raja Mansingh's Palace, Teli ka Mandir, Sas Bahu ka Mandir. and the Gujari Mahal Museum, as well as the atmospheric Sound and Light Show in the evening. Don't miss a visit to the Tomb of Tansen, an icon of Indian classical music; the tomb, near the beau­tiful Mausoleum of Mohammad Ghaus. is the site of a famous yearly music festival. The Jai Vilas Palace and Museum, the Sun Temple and the Gurudwara Data Bandhi Chhod are also worth a visit. Mentioned in the Mahabharata as Daityavakra. Datia is most famous for the 17th-century, seven-storey hilltop Palace of Raja Bir Singh Deo. Among its main historical monuments, don't miss the temple with Mughal frescoes and the Gopeshwar Temple. Getting here: 34km from Jhansi; 69km from Gwalior. A rich legacy of the Bundela rulers, who built beautiful palaces and temples here in the 16th-l 7th centuries, Orchha was founded by chieftain Rudra Pratap on a stretch of land along the river Betwa. It was thereafter most notably ruled by Raja Bir Singh Ju Deo, who built the exquisite tiered Jehangir Mahal, crowned with chhatris. The view from the palace, of soaring spires and cenotaphs, is spectacular. The walls and ceilings of the Raj Mahal and Laxminarayan Temple, covered in murals of the Bundela School of Painting, are as lovely as the exteriors. The site is also strewn with little shrines and memorials, each with a history, and each contributing to the beauty and nostalgia that is Orchha. Also see the Rai Praveen Mahal. Ram Raja Temple. Chaturbhuj Temple, Phool Bagh, Dinman Hardaul's Palace. Sunder Mahal, Chhatris and the Shahid Smarak. Getting here: 16km from Jhansi. Don't miss the Koshak Mahal. Badal Mahal Gate. 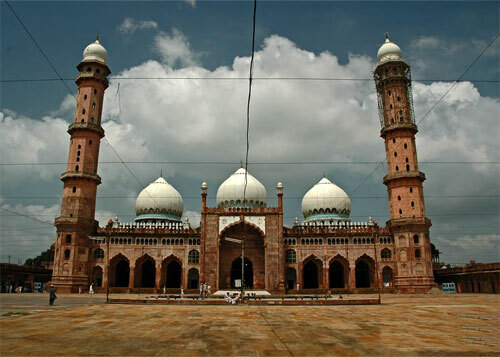 Jama Masjid. Shahzadi Ka Rouza. Parameshwar Tal. Bavdi and Buddhi Chanderi. And. of course, pick up some of the famous Chanderi saris. Getting here: 127km from Shivpuri: 37km from Lalitpur. The Great Stupa at Sanchi. built by Emperor Ashoka. has become an icon of India's cultural heritage, and is another World Heritage Site. It is the most famous of a host of stupas, monasteries, temples and pillars on this hill, dating from the 3rd century BC to the 12th century AD. A sandstone pillar fragment here carries Ashoka's famous edict warning against schism in the Buddhist community. Stupa 1 was found empty, while the relics of the two disciples of Buddha, enshrined in the adja­cent Stupa 3, were taken to England. The Gateways of Stupa 1. carved with stories of the Buddha's life, are the finest specimens of early classical art. Don't miss the Gupta Temple and the Archaeological Survey of India Museum which houses some of the earliest known stone sculptures in Indian art from the 3rd to the 1st century BC. The adjacent town of Vidisha has a State Museum with important medieval sculptures and the Lohangi Hill monuments. Nearby, the 2nd century BC Heliodorous Pillar and the 5th century AD Udaygiri Caves are well worth a visit. Getting here: 46km via Diwanganj; 72km via Raisen from Bhopal. Founded by the Parmara King of Dhar, Raja Bhoja (1010-1053), and named after him, Bhojpur is renowned for its magnificent Shiva Temple and Cyclopean Dam. The 11th-century Bhojeshwar Temple—often called the "Somnath of North India”—was never completed and the earthen ramp used to raise it to dome level still stands. The massive patterns engraved on the surrounding rocks suggest that there was a grand architectural plan for the tem­ple. It is generally agreed that, had it been completed, it would have had few rivals. Even incomplete, it is one of the best examples of 11th-13th century temple architecture. The lake to the west of Bhojpur. created by two huge stone-and-earth dams, no longer exists. Nor do the dams (said to have been about 100 metres wide at the base), which were destroyed in 1430 by the Malwa ruler, Hoshang Shah. Getting here: 28km from Bhopal. Embraced by the northern Vindhya range and covered with huge rocks. Bhimbetka is where India's richest collection of prehis­toric cave paintings was discovered in 1957. Over 600 rock shelters—the largest group in the world—har­bour paintings that date back to the Early Stone Age. This marvellous ancient art. found in about 500 caves, depicts hunting, dancing, music, horse and elephant riders, animals, honey collection, decoration of bodies, disguises, household scenes, and religious and ritual symbols. The treasures at Bhimbetka have recently been designated a World Heritage Site. Getting here: 46km from Bhopal. The palace of Bhopal's Afghan rulers, Islamnagar was built by Dost Mohammed Khan. It's palaces & pavilions are a synthesis of Hindu and Islamic decorative art, surrounded by formal Mughal gardens. Other monuments to see here include the Hammam of Chaman Mahal, and the Rani Mahal. Getting here: 11km from Bhopal on the Bhopal-Berasia Road; 20km on the Bypass Road. The erstwhile fort capital of the Parmara rulers of Malwa. Mandu was renamed Shadiabad. the 'City of Joy', by the Sultans of Malwa at the end of the 1 3th century. It embodies the love of the poet-prince Baz Bahadur for his beautiful consort Rani Roopmati: her pavilion, high on the crest of a hill, still overlooks his magnificent palace, and the balladeers of the region still sing about their love. The Sultans built exquisite palaces such as the Jahaz Mahal and the Hindola Mahal ,as well as ornamental canals, baths and pavilions. Under the Mughals. Mandu became a pleasure resort; with its many lakes and palaces, celebrations were extravagant, and the prevail­ing spirit was of gaiety. Each structure in Mandu is an architectural gem—don't miss any. especially not the massive Jami Masjid, and Hoshang Shah's Tomb, which provided inspiration to the builders of the Taj Mahal. Within the royal enclosure, it's well worth visiting the Champa Baoli. Dilawar Khan's Mosque. Nahar Jharokha, Ujali (bright) and Andheri (dark) Baolis. Gada Shah's Shop and House, and Taveli Mahal. Also visit the Ashrafi Mahal, opposite Jami Masjid and don't forget Nilkanth Temple and Mahal. Hathi Mahal. Dariya Khan's Tomb. Dai ka Mahal. Dai ki Chhoti Behan ka Mahal, Malik Mughath's Mosque. Jali Mahal and the popular Echo Point. Getting here: 99km west of Indore.